2 Large Cheese Pizzas, 10 Pcs. Wings, 2 Liter Soda. You can't use discount code for family specials. 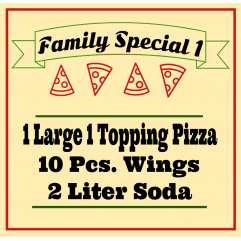 1 Large 1 Topping Pizza, 10 Pcs Wings, 2 Liter Soda.You can't use discount code for family..